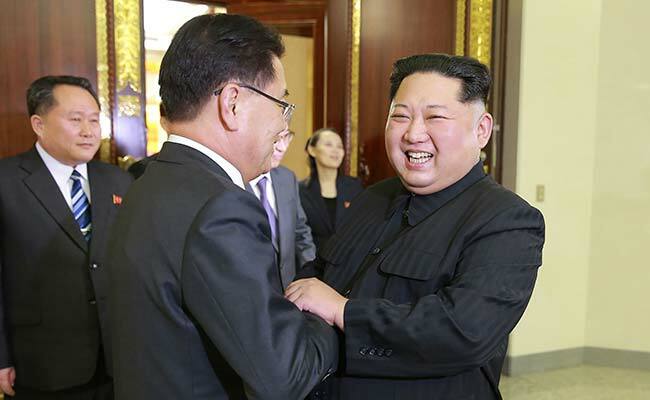 China Hails Inter-Korean Summit, Says "We Are Cheering Them On"
The comment came a day after Seoul announced plans for the meeting in late April between North Korea's Kim Jong Un and South Korea's Moon Jae-in. Beijing: China on Wednesday warmly welcomed an agreement between North and South Korea to hold a summit, declaring: "We are cheering them on." The comment came from foreign ministry spokesman Geng Shuang, a day after Seoul announced plans for the meeting in late April between North Korean leader Kim Jong Un and South Korean President Moon Jae-in. The South, reporting the outcome of a historic trip by its envoys to Pyongyang, said the North was also ready to halt nuclear and missile tests during any dialogue, and would consider abandoning WMD programmes in return for US security guarantees. "We are also very pleased to see the positive results of interaction between the two sides," Geng told a regular news briefing. China hopes "relevant parties can seize the current opportunity, make joint efforts to solve the issue of the denuclearisation of the peninsula and promote the political settlement of the issue," he said. Beijing was willing to play its due role, he said, and work with other nations to promote denuclearisation of the peninsula. Noting that China has supported the recent exchanges between the North and the South since the Pyeongchang Winter Olympic Games, he added: "We are cheering them on." Under pressure from US President Donald Trump, Beijing has backed a series of United Nations sanctions against North Korea, sending relations between the Cold War-era allies to a new low. Moon on Wednesday sounded a note of caution about the North's comments, saying it was "too early to be optimistic". Trump welcomed Pyongyang's offer as positive -- and apparently sincere -- crediting Washington's "very, very strong" sanctions push, as well as "big help" from China, for the potential diplomatic breakthrough. Calling the statements from both Seoul and Pyongyang "very positive," Trump refused to rule out a historic meeting with Kim. Tuesday's breakthrough should please Beijing, which has repeatedly called for negotiations to resolve the nuclear crisis. China has also urged the United States, Japan and South Korea to suspend joint military drills in the region in return for North Korea halting its nuclear and missile tests.